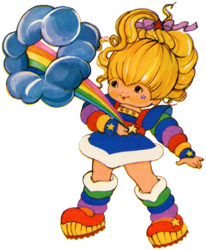 If you've perused Rainbow Brite books at all, I'm sure you've noticed that certain poses were used over and over. It may have a different background, but the characters will be standing in the exact same position as they were in 10 other books/stickers/cards/puzzles. I'm sure that reusing art saved the companies involved a lot of time and money, but the lack of variation saddens me. And as we collectors get closer and closer to owning all known RB books/stickers/cards/puzzles, we must face the fact that eventually we will have seen it all.